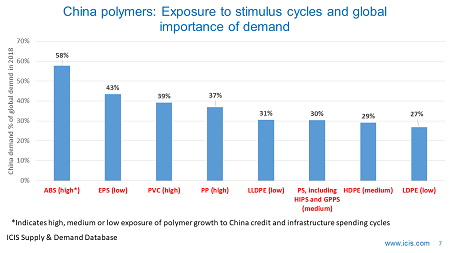 CHINA HAS changed its strategy for the petrochemicals and polymers where it is in deficit. Previously, the government accepted China’s position as a major importer. Now the plan is to move into balanced or long positions with any surpluses exported via the Belt and Road Initiative (BRI). Petrochemicals are seen as a means of escaping the middle income trap. This explains China’s intention to build 21 new state-of-the art steam crackers and around ten new refineries in petrochemicals industry parks. This wave of capacity could include as much as 26.7m tonnes of additional ethylene capacity by 2022. Improved rail, road and sea links between China and the other 71 other countries that make up the BRI could give China’s petchems producers major logistics cost advantages. If China builds the world’s biggest free trade zone – another key element of the BRI – Chinese producers would also have duty free or low duty access to these 71 countries. This would have major implications for the global petchems business, given that China is by far the biggest importer of petchems globally. Take these imports away and the logic behind building more world-scale crackers and other petchems plants outside China would be significantly weakened. 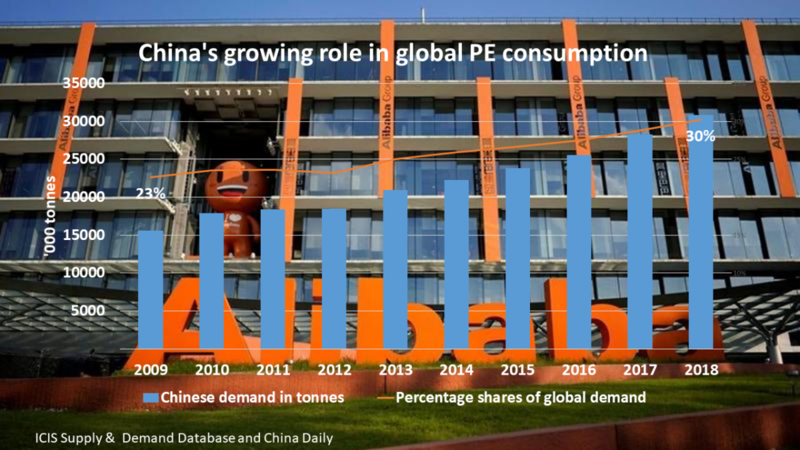 Cracker-to-polyethylene (PE) complexes already built in the US would also be in trouble. Yes, import requirements in other developing countries and regions are growing very rapidly. But this is from a much smaller base than in China. 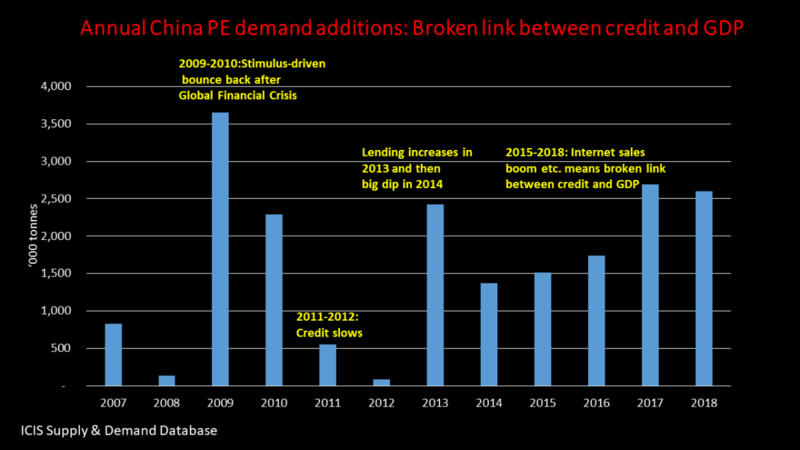 Take China out of the equation and building a million tonnes/year cracker with downstream PE etc. outside China would be far harder to justify. We also need to take into account the drop in demand for virgin polymers that is going to occur as a result of sustainability pressures. Public opinion has shifted firmly against single-use plastics. Wave after wave of new legislation that eats into virgin resins demand will be the result. Don’t assume that this fall in demand will largely be confined to the EU. 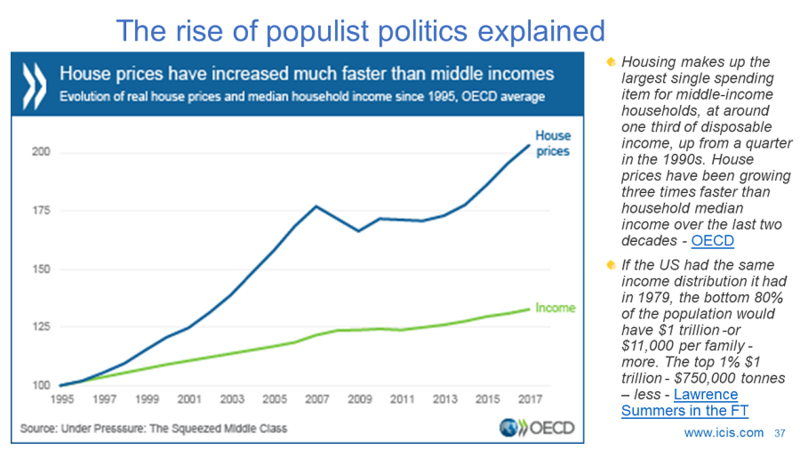 The argument for building new crackers and other petchem complexes in feedstock-advantaged regions is the “rise of the middle classes in the developing world”. As people rise out of poverty (and please be careful of the definition of middle class), there is no doubt that they consume more petchems and polymers as they buy greater volumes of modern-day consumer goods. But as people get richer, they also become more environmentally conscious. And here is a shocking statistic: Of the 7bn people in the world, 2bn lack access to any kind of rubbish collection systems. They are thus forced to dump their plastic and other rubbish straight into rivers and oceans. Most of these 2bn live in the developing world. The reputation of the polymers industry is being damaged through public awareness of the plastic rubbish crisis thanks to greater attention from the media. Take as an example David Attenborough’s Blue Planet 2 BBC series. Our very license to produce is under threat unless we invest in recycling, and in so doing destroy virgin resins demand. It is equally obvious that governments everywhere will see plastic rubbish as a valuable feedstock source – especially, perhaps, if a country lacks hydrocarbon reserves. Does it really matter if your feedstock is ethane, naphtha or recycled plastic? Feedstock is feedstock. Where will China get the natural gas liquids (NGLs) and oil/naphtha feedstock it needs to build 21 new stream crackers that would more than double its ethylene capacity? As the demand for oil falls on the rise of electric vehicles, the holders of oil reserves will be keen to avoid leaving reserves in the ground. China will be in a strong position to purchase crude imports at very competitive prices. NGLs have to be extracted from methane before they are either transported via pipelines are frozen and shipped as liquefied natural gas. 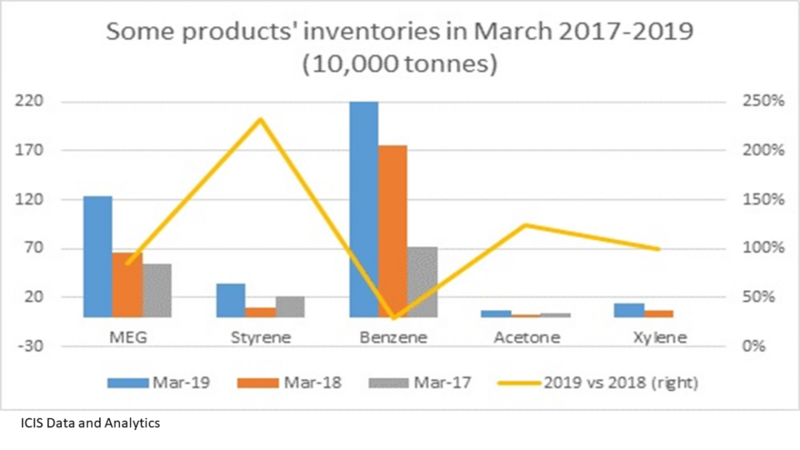 Petchems producers in the US and the Middle East will be consuming less NGLs because of the decline in virgin resins demand. Yet, as I said, the NGLs will still have to be extracted by the gas producers before they can sell methane. This will give China the opportunity to buy NGLs at very competitive prices. Fifteen coal-to-olefins (CTO) projects and four methanol-to-olefins projects are also part of China’s new investment wave, representing 21% of the 26.7m tonnes of ethylene capacity that China could build by as early as 2022. This suggests that those who wrote off the future of the CTO industry for environmental reasons were wrong. CTO plants that are part of wider coal gasification facilities, and are located away from China‘s main population centres, can actually benefit the environment. And of course here China has its own feedstock as it has big coal reserves. Meanwhile, new MTO plants in China may be based on imported methanol from the US. The shale gas revolution has resulted in very cheap methane to make methanol in the US. 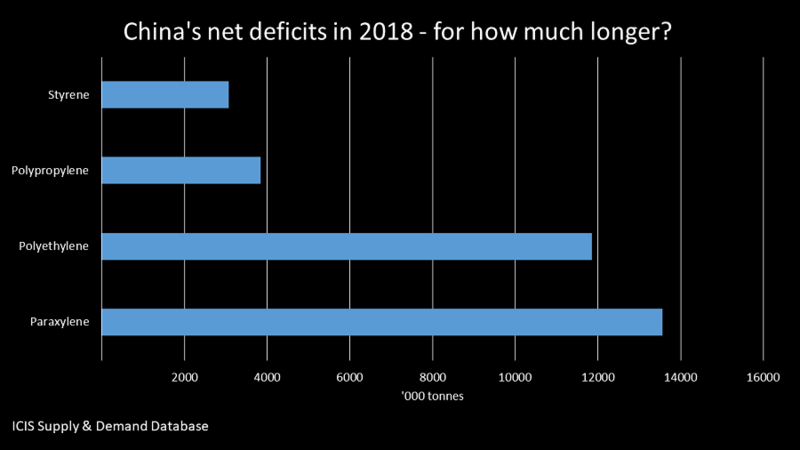 The easy thing to do would be to assume that China’s new petchems strategy will amount to very little change. This would avoid having to ask difficult and politically risky questions if your company is pursuing an investment based on being able to export big volumes to China. Assuming that there will be no change in the status quo will also avoid having to take a new and so more difficult look at demand and supply forecasts. 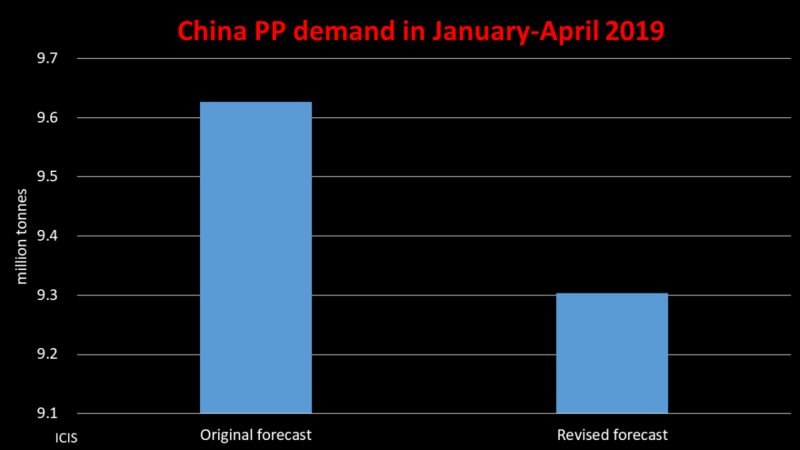 For many years, China’s demand has been way ahead of supply. This makes predicting no change quite an easy task. 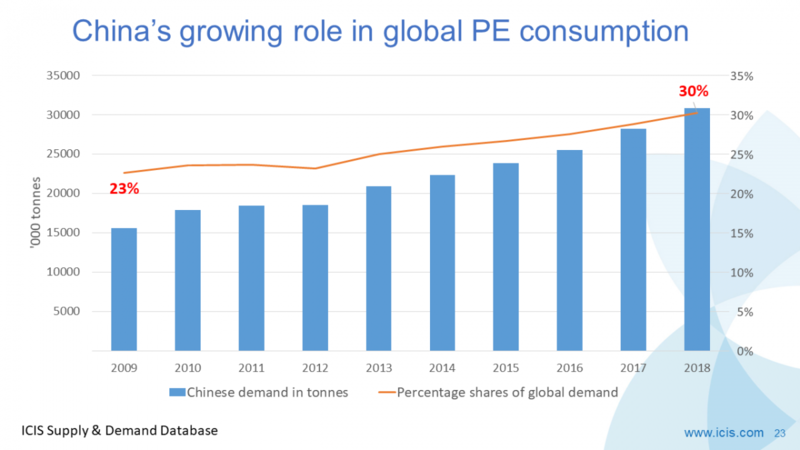 Far harder is building new models where China moves into surpluses in say the two biggest ethylene and propylene derivatives – PE and polypropylene. Building new models would require detailed knowledge of China’s new wave of project proponents, which heavily involves Chinese private companies that outsiders have little knowledge of. Global trade flows would have also have to be redrawn, essentially from nothing, as there would be no history to work from. But the easy approach is the wrong approach. China has a long track record of doing what it says it is going to do. Just look at the success of the recent anti-pollution campaign as one example. Then there is the government following through on its promise to move up the manufacturing and services value chain. 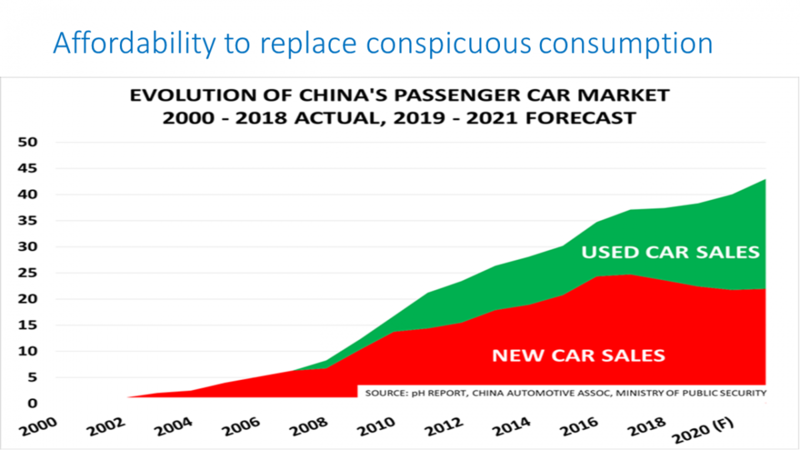 Sceptics has been proved wrong by China successfully moving into sectors such as electric vehicles and mobile internet sales. China is issuing more patents than the US, with big improvements in the quality of Chinese patents. Opportunities are huge for petchems companies that accept China’s shift towards self-sufficiency and the global rise of sustainability. It will be tremendously rewarding for the “early adopters” willing to stand out from the misguided crowd. But taking advantage of these opportunities will require a lot of very, very hard work.